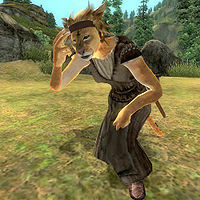 Ashni is a Khajiit commoner who is a devout worshipper of the Daedric prince Sanguine, and can be found with her fellow worshippers at the Shrine of Sanguine. In combat, she relies on an iron dagger. She wears a belted vest, a pair of coarse linens and stitched leather shoes. She only carries a small amount of gold. Leading a simple life of a worshipper, she spends her days walking around the shrine, taking breaks throughout the day sitting on of the many benches. She also preaches to her fellow worshippers of Sanguine and prays at the shrine itself. When you approach her, she will explain why she chose to worship a Daedric prince whose sphere is hedonistic revelry, debauchery, and passionate indulgences of darker natures: "I joined for the parties. And stayed for the parties. Why would I go back to work? That life is for suckers and fools."